Taylor Gray and Sierra Carson-Mills have been best friends their whole lives. Their parents were best friends, and the girls have grown up doing almost everything together- although they don’t share a blood bond, it is as though they are sisters. But while Taylor’s life has been fairly grounded (despite losing her father to illness several years earlier), Sierra’s life has been far less stable. With her parents often away- either hosting a charity event or running their internationally-based ski resort- Sierra often seeks the attention of anyone who will give it to her, and isn’t afraid to act out to receive it. Despite the parental neglect, Sierra, with her beauty, wealth and popularity, seems to get everything else she desires, and Taylor eventually starts to get fed up with her attention-seeking antics. This is especially the case when Sierra kisses Taylor’s crush (although she admittedly doesn’t know that Taylor likes him at the time). To add to the hurt, Sierra decides to meet up with a guy- Jacob Jones- who she met online- a guy that Taylor had also been talking to, and who she felt a real connection with. Sierra, unaware of the pain that she is causing, asks Taylor and their friends Callum, Riley and Joel to cover for her when she meets him for the first time, and the group reluctantly agree. When the Friday night date becomes an overnight stay, Taylor is annoyed but not overly concerned. After all, Sierra has done this before, and no one got into any trouble over it. Sure, Riley was inconvenienced and still holds a grudge about the incident, but none of their parents ever found out about it. When the overnight stay extends into an extra day, and there has been no word from Sierra, Taylor and the others begin to worry a little about where she could be. It isn’t until two days later, when Sierra still hasn’t contacted anyone, and her phone has remained unanswered, that Taylor finally tells Sierra’s mum Rachel that her daughter is missing. What follows is a frantic search involving the Sexual Offences and Child Investigation team, the local police and a specialised group of detectives, who try to uncover Sierra’s trail, and locate the mysterious Jacob Jones. If you have ever been wary about the dangers of online dating, chatrooms or social media, then this fictional novel is not going to put your mind at ease. The issues in Risk are all too real, and the scary thing is that they could happen anytime, and to anyone. The fact that the story is based in suburban Melbourne, and that the main characters are only fifteen adds another realness aspect to the plot- it brings the situation closer to home, and makes the story much more credible than if you were reading about a group of American teens. 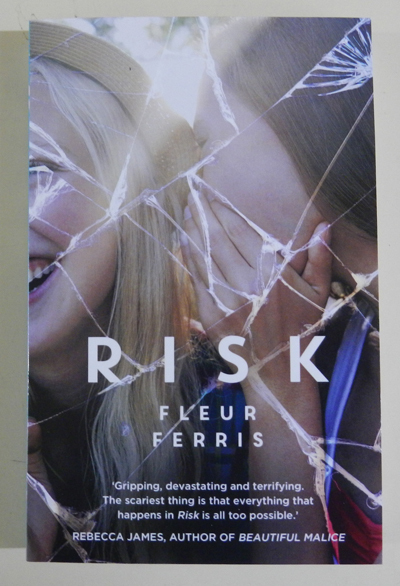 Fleur Ferris, the author of this novel, has previously worked as a paramedic and a police officer, and this experience is also evident within the text. You can tell just from reading the book that the distress that Sierra’s family and friends experience during the police search, comes from the perspective of someone who has dealt with that kind of trauma before. I have to warn that this book does not have a happy ending, and that the conclusion of the investigation may come sooner than you expect. In fact, a majority of the book is about Taylor and her friends as they cope with the news of Sierra and try to raise awareness of what can happen when you partake in seemingly innocent internet behaviour. This is a tale about online predators, negligent behaviour and naïve innocence, and is a worthwhile addition to any teenager’s reading list.